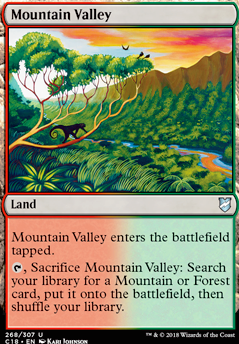 , Sacrifice Mountain Valley: Search your library for a Mountain or Forest card and put it onto the battlefield, then shuffle your library. In this style of deck I like playing Life from the Loam as it synergies really well with what the deck wants to do. Also, fetchlands work really well with Crucible of Worlds but if you do not have the budget for them, Rocky Tar Pit and Mountain Valley are good budget alternatives. Additionally, with you running Scapeshift you could run Valakut, the Molten Pinnacle as a combo finish with enough mountains. Also, if you find yourself low on cards, I really like the card Painful Truths as a solid draw engine in the early game outside of Lord Windgrace. I also like additional ramp that can be provided in cards like Farseek and Sakura-Tribe Elder . Hope this helps! Omnath off with their heads! Here is my omnath deck. The more expensive cards aren’t fully necessary in it but help it. Burgeoning is incredibly good though and so is Scapeshift , they are worth the price. I think you have too many creatures in your deck and not enough land and ramp. The idea here is to just spew out land...all the land. 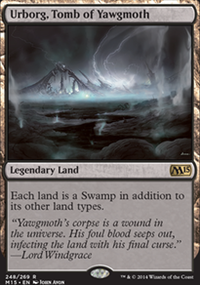 Lands that get other lands are great so you can get multiple landfalls per turn. The panoramas, Myriad Landscape , Rocky Tar Pit , Grasslands , Mountain Valley these are all necessary and super cheap. Ghost Town is an absolute must, it guarantees land drop every turn. You also don’t need those life gain lands, they’re too slow. 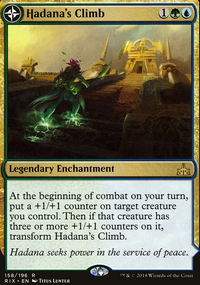 Ramunap Excavator is great for playing your lands that fetch other lands, this allows you multiple land falls per turn. More ramp means more landfall also. You need all the ramp you can, so that you can get omnath out as early and often as possible. Plus once he’s out the ramp triggers more tokens. If you like to fetch lands for cheap, Mountain Valley , Grasslands and Blighted Woodland are cheap picks. Deadpoo111, I agree. And I dont have the money to be spending 50 a pop on fetch lands either bro. Which is why i run only the slow fetch's i have in the colors besides Mountain Valley like the one you listed, but thats in my Omnath, Locus of Rage deck.The theft effects i have in here are because when Marchesa,the Black Rose's Dethrone ability triggers if you attack the player with the highest life total, she puts a +1/+1 counter on the stolen creature which allows me if it dies to "return it to the battlefield under my control" Allowing myself to gain control of the creature permanently, rather than just until end of turn. Hopefully that explains the sac outlets. I want my creatures, my opponents creatures, all of the creatures to die to get extra etb and exit the battlefield abilities to trigger often. On my side of the board. Here's what I've found, and while this is taboo to talk about especially with all the modern players these day, you don't need fetches unless you are in a ridiculously competitive meta. 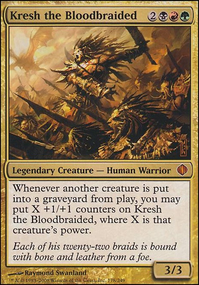 There price just isn't justified for a slower format like commander. I would definitely recommend the slow fetches, which you're already running one of, Grasslands , Rocky Tar Pit , Bad River , Flood Plain , and Mountain Valley . I have great experiences with these and while they may be a turn slower, I've found that turn doesn't really matter. It surely helps my wallet. Other than that, this looks like a pretty standard Marchesa deck, except for the theft. Any reason you're running that? I'd love to know. Good starting point for what I think is a precon upgrade! 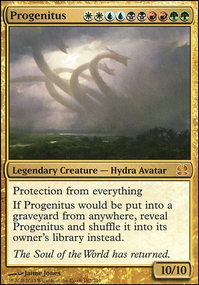 I run myself a lands deck (Thrasios and Bruse, missing out all that sweet Jund goodstuff, sigh) and I can only advise to upgrade your land department. 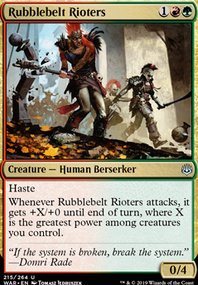 Finally, being Jund naturally more inclined towards sacrificing shenaningans, I cannot leave out Perilous Forays .